"The kitchen sink is not, perhaps, the first place that we might think of as being one of those joining points of earth and heaven. ... But a meal is a collective enterprise, and so is the cleaning up ... a shared privilege and responsibility of eating together. ... This opportunity for combining practical labor and companionable conversation is near the center of what it means to make a household together. ... Dishes, along with other kinds of domestic work, can be opportunities to ... build relationships and nourish the soul" (141-45). 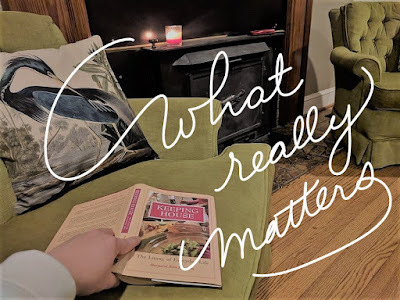 It may seem odd to open a post about "what really matters" with a quote about doing dishes. But having experienced six weeks at the start of this school year without a kitchen sink, when an excerpt from Margaret Kim Peterson's Keeping House: The Litany of Everyday Life came into my newsfeed (shared on Facebook by an artist friend who has highlighted in much of her work the value of domesticity), it piqued my interest. And when an Amazon gift card from my thoughtful sister-in-law popped into my inbox, it was only a matter of days before this book was in my hands. Margaret Kim Peterson delivers no checklists or recipes; rather she develops a full-bodied theology of what it means to make a home. Rather than the hows of keeping a house, she focuses on the heart of keeping a home. And as our family embarked on transforming a 1947 fixer upper into our new home, despite (and perhaps because of) the struggles of this summer and fall semester, Keeping House: The Litany of Everyday Life was a timely meditation. In Part 1 of "what really matters," we worked through Paul's prayer for those he cherished so deeply in Philippi: that (and I paraphrase) "with the ever-clarifying filters of sincere and sacrificial love as well as knowledge and depth of insight, they would be able to discern what really matters." I had already been ruminating on Paul's prayer when I began this book. Then I read of the difficult years when Margaret was caring for her increasingly ill husband, his needs "absorb[ing] more and more of [her] energy, until in the last few months of his life [she] could do little more than moan to [her] therapist, 'I can't cope; I can't cope; I can hardly get to the grocery store.'" And she wrote, "I understood then, with a clarity that I have experienced at few other times in my life, that getting to the grocery store was one of the things that Really Mattered. [Had she really just used that phrase!?] ... Forget fantasies of 'accomplishing something," Margaret wrote. "Perhaps somewhere in the world there were people who measured their days by how much they got done--at work, in class, wherever. I measured my days by whether, at the end of them, the members of my household had been dressed and fed and bathed and put to bed. If we had been, then that was a good day. I had done what mattered most. Everything else was gravy" (2). I was hooked. Here was a woman who was vulnerable enough to tell of some of her darkest days and whom God have given a depth of insight because of the challenges she had lived through. Here was a woman who, though in the midst of pursuing her own PhD, had the courage to seek out a therapist who could speak truth into her life and help her sort out "what really matters." And here was a woman who could use mashed potatoes as a metaphor for the necessities of life and see "Life's Little Extras" as gravy! I am so thankful for the timeliness of my discovering this book. Margaret's theological musings have helped me take my hands off things that matter less - and to embrace the things that matter most. She's encouraged me to be more patient with the timing of renovations - and more intentional in the nurturing and discipling of the people who live here with me and those who happily accept an invitation to enter into life with us despite the renovations yet to be done. It's adjusted my lense to be able to see that "housekeeping is about practicing sacred disciplines and creating sacred space" (xiii). And that "Making a home involves constructing and maintaining an environment in which people can flourish" (27). She makes good points about beauty and functionality, simplicity and hospitality. She talks about clothing and laundering, about cooking and eating and cleaning up, about creating and communicating, and about reflecting and sleeping. And throughout the book, interestingly, she repeats our phrase: "identify what really matters" (18); "if we want our children to develop and enjoy competence in the practices that go into making a home, we will have to show them by our own example that these are things that really matter: they are worth doing, worth caring about, and worth handing down to the next generation" (37); "cooking does matter" (118); "cooking - like so many other aspects of the Christian life - is much more about what you do with the resources at your disposal than it is about what those resources are. Many is the person with limited funds or limited space or both who has turned out pot after pot of delicious soup or stew with little more to hand than a knife, a pot, and a hot plate. We might wish to have bigger or better-equipped kitchen than in fact we do, but what matters is the faithful production of dinner (and lunch and breakfast) in the kitchens we do have" (135). 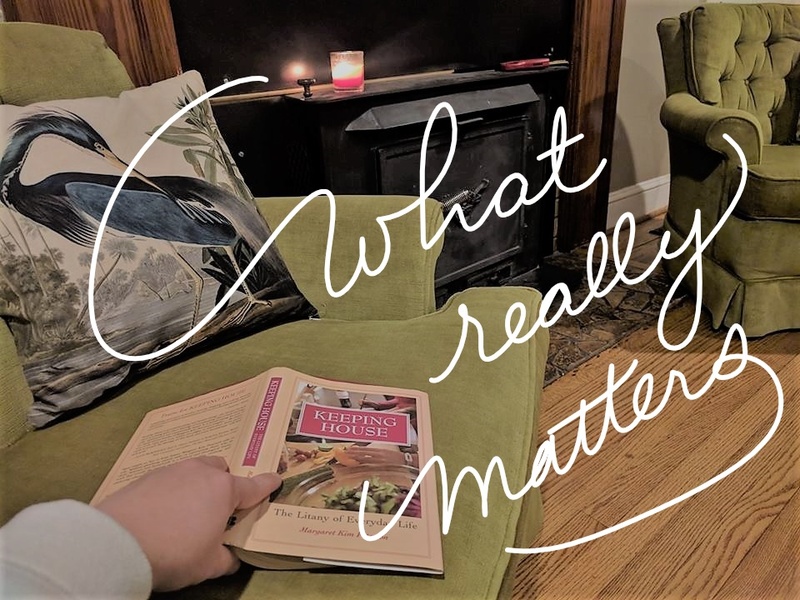 For me, Margaret Kim Peterson's Keeping House: The Litany of Everyday Life brought home the "what really matters" lesson with intensely practical applications. "tell [the] older women [in his congregation] to live their lives in a way that shows they are dedicated to God. Tell them not to be gossips or addicted to alcohol, but to be examples of virtue ... [to] teach young women to show love to their husbands and children, to use good judgment, and to be morally pure ... to be homemakers, to be kind, and to place themselves under their husbands' authority" (GW). And the serious implication for this instruction: that people would have the right opinion of God's Word. It fits that as Paul addresses believers in various locations, he focuses their attention on the same things. Remember: love, discernment, and purity were all mentioned in Paul's prayer in Philippians 1 too! For these are the things that really matter as we learn to live a life of faith and obedience. And as I seek to apply Philippians 1, I can't escape Titus 2. One other significant overlap between homemaking and the themes in Philippians is the idea of being a servant. "A complaint commonly lodged against housework is that it is 'menial' - work for servants - in contrast to other, higher-status kinds of work that may not include getting one's hands dirty. But," as Margaret puts it, "if in Jesus God Himself could take up a towel and wash other people's feet, surely we ... can find it in us to wash one another's dirty clothes and dirty dishes and dirty floors. Active engagement / with ... housekeeping can be a way of remembering that a properly human life is a life of service" (39-40). And as Paul puts it, "Let this mind be in you which was also in Christ Jesus ..." (Philippians 2). 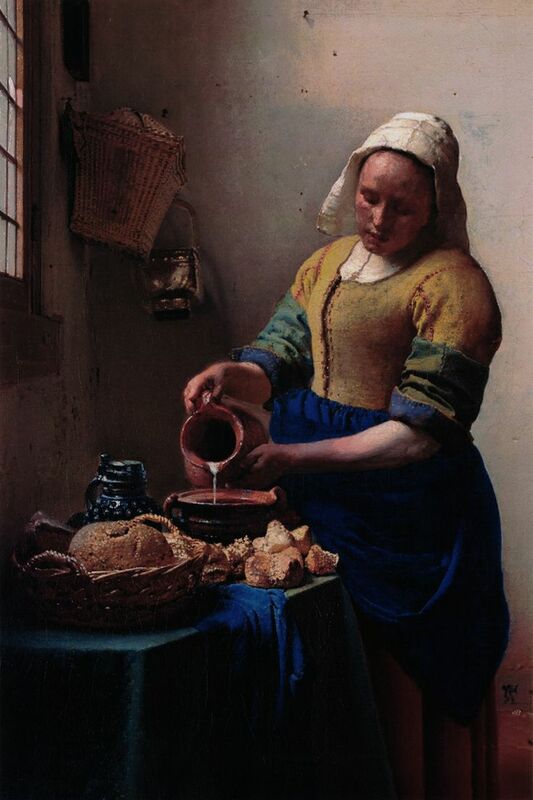 Eventually, as a visual reminder of the "what really matters" lessons God is working to accomplish in my own heart and home, I would love to hang a reproduction of Vermeer's The Milkmaid in my kitchen. I am absolutely in love with this painting! Those who know me well may testify: I am a bit obsessed with cobalt blue in my kitchen. Even more than its color palette though, I love this painting for its beautiful portrayal of a servant at home. Note her serenity and dignity, her careful pouring of fresh milk into the tureen, and the labors of love demonstrated in the making of bread (and potentially bread pudding) for the one(s) she loves. So as I close, my dear sister, this I pray: that our love would grow still more and more in knowledge and depth of insight, that we might discern what really matters - including how we can give others a good opinion of God's Word by loving our husbands and children and keeping well our homes - that we might live pure, and that on that Day when we are presented to our Savior, we might be unashamed and rather rejoice to see in His face that we have made Him smile. May His grace be with your spirit.